Globes: Ratio joins as a 20% partner in the "Sarah" and "Myra"
The partnership will work to locate a new drilling operator to replace GGR and the selected operator will receive a 25% interest in the licenses. In the event of a commercial discovery under the licenses, Ratio will pay the partners 10% of its revenue from the sale of oil and gas generated from the licenses. 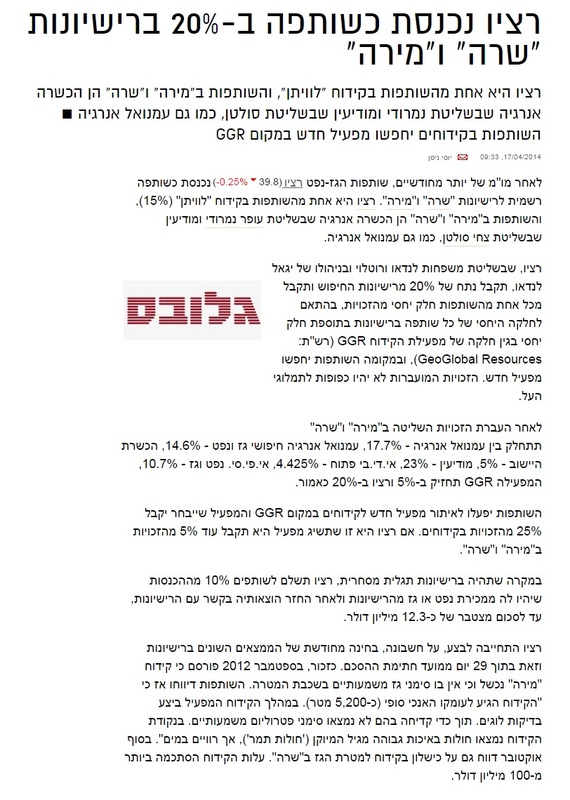 CEO Yigal Landau indicated that Ratio will re-examine the various findings in the licenses, at its own expense, within 29 days of signing the agreement. This entry was posted in Gas and Oil, Media References and tagged Globes, Ratio, selling oil drilling licenses, Yigal Landau. Bookmark the permalink.